Recently moving out on my own for the very first time (left my ex of 11.5 years), I'm looking for all kinds of ways to decorate my home and make it my own. I stumbled across Dove and David and fell in love with a few of their items. This Pillow is so much fun! Perfect for a wedding gift or housewarming. Names, wedding date is optional on this pillow. So gorgeous! Then we have the LOVE Lives Here pillow. This one is fully customizable, Hawaii and Alaska can be added, as well as other countries. Up to 8 locations can be chosen. This one is so fun for military families, or those who move a lot. Also those with a lot of family spread over the world! "Everyone needs some cushy pillows. Why not make them more personal or unique in some customized way! I had another pillow shop and knew graphics design so I decided to combine the two skills to create this! Now it's my customers who inspire me every day. I never knew such love existed until I opened this store. I even met my love in the early days of Dove And David probably from realizing it's totally possible to find true love! I have serious insight on how to write the perfect wedding vows now ;) "
I'm in love with Steph and her Shop!!! Her pillows are all adorable and she has over 75 to choose from! Price: Pillows in a 12x18 size are $38-$58 depending on material, She also has 16x20 and 20x24 sizes! 2 WINNERS ARE EACH GOING TO WIN 1 PILLOW. YOU CAN CHOOSE FROM THE 2 I POSTED ABOVE, CUSTOMIZED, IN THE 12X18 SIZE! *Disclaimer* I received compensation directly from Dove and David. I really like the birth pillows. I would get the personalized song lyric pillow! I would definitely get the Linen Song lyric Pillow for my husband for our anniversary! I love the Map pillow. We have a place Up North with a couple families, how cute would that be to pt the hearts on the places where we all come from. I love the "sister to sister" pillow. My sister and I live on different continents, and this would be a great gift for her. I love the Mr. & Mrs. pillows. Adorable pillows! Hard to pick one favorite, the Personalized Map Pillow is really cute! I like the Birth Announcement pillows. Thanks for the giveaway! I like the Customized Initials Pillow. I like the I Love You pillow! I want the Song Lyric Pillow for my mom. Her song for me is "The Best Gift" by Barbra Streisand. I also like the Rustic Pineapple Pillow. I love these and especially the perfect map pillow, rustic! Thanks so much for the chances to win. I think pretty much all these pillows are cute but I do like the names pillow cause theyre simple and sweet and make good gifts for a spouse or for a friend or family member who may be getting married or is married. Your my Lobster is cute! I like the Personalized Song Lyric Pillow. 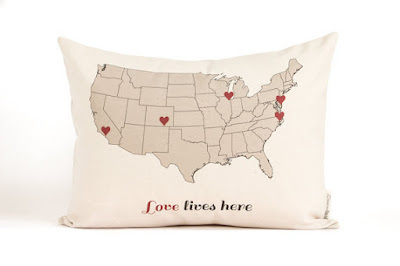 Personalized Map Pillow, Long Distance Throw Pillows. I also like the Rustic Flamingo Pillow. I like the Linen Song lyric Pillow. 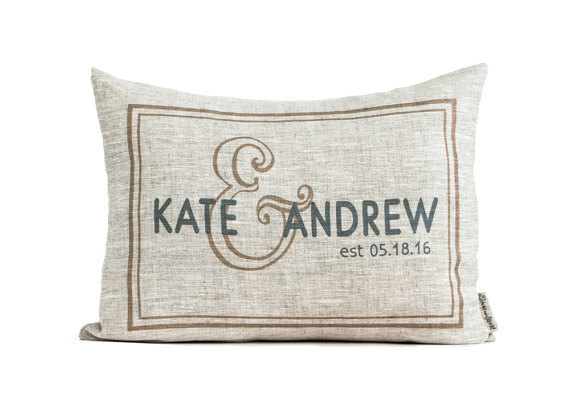 My wife would absolutely love to have the cool Personalized Gift for Her pillow to always use daily. A fascinating Personalized Gift for Her pillow, my wife would enjoy using daily.and it would be an amazing gift. My lady friend likes good things, and a Personalized Gift for Her pillow would be just marvelous to see and great for all occasions. I really like great items, and the wonderful Personalized Gift for Her pillow would be good to use all of the time. The captivating Personalized Gift for Her pillow would be really fabulous for my girlfriend to use.and it would be nice to have around. The awesome Personalized Gift for Her pillow would be just right,to use everyday and my wife to have, always.